Welcome to another Tutorial Tuesday! 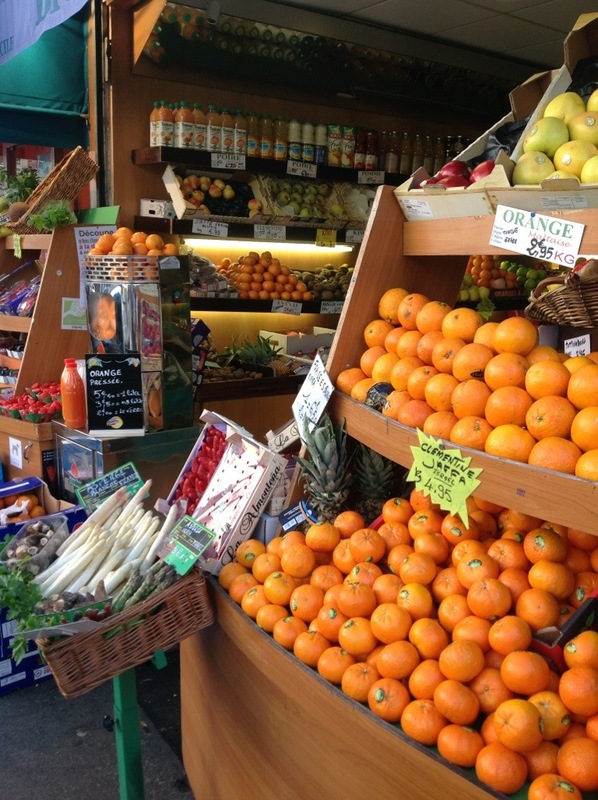 Note: The photo above is from one of the many little neighborhood fresh markets in Paris. Interestingly, families in Paris don’t shop once a week or once a month–they shop several times a week and buy what is fresh. This is easier because most people walk to and from work (or the metro) and the markets are everywhere. If I could walk past a bakery and purchase fresh bread every few days, I certainly would do it! Shifting your food shopping from the grocery store to the farmer’s market can present some challenges. You don’t always know what you’ll find at the market (especially when you’re first starting out) and you do need to have a bit more flexibility in your meal planning. Continuing the theme of how to shop efficiently and affordably while still eating local, I have 10 tips from our own family experience! You know those picture books with Farmer Brown plowing a field with oxen or riding in a horse and buggy? Well, those books need a major update. Most farmers who sell to local markets are pretty media savvy (or at least they are getting there). They probably have a Facebook page, an email newsletter and/or Twitter account. Crazy, right? I get weekly postings on what is available from local farmers and farmer’s markets in my area. That saves me a LOT of time when planning menus because I’m not guessing at what I’ll find. One example of this is my Slightly Badass Blackberry Jam. Be open to the possibilities as long as you can use the produce! These are all recipes that can use unlimited combinations of vegetables, grains and protein, making the most of what is seasonal and available! Now that I’ve addressed flexibility, once you have your list, stick to it unless you are POSITIVE you will use it. Back away from the impulse purchases that have no relationship to your menu. If you don’t have a recipe that will accommodate, say, rutabegas, and you can’t freeze them for later (see below), then do not buy them. I mean it…scoot, scoot! Americans throw away an obsene amount of food each year. Sometimes it happens that I get a huge amount of one vegetable in our Produce Box and it’s more than we can eat right away. Or maybe we have a last-minute change of plans and we don’t end up eating all our meals. In this case, the freezer is your best friend. Rather than throw away chicken because we didn’t make a big dinner, I can roast or bake it while we’re finishing up homework, take it off the bone and freeze it for later. Or, like last week when I received WAY more spring onions that we needed, I chopped them up, bagged them in freezer bags in 1 cup servings and froze them for later. Greens, like collards, mustard greens, kale and turnip greens, can also be cooked and frozen to eat later. Don’t waste that produce! I’m human. And I love seafood. So when fresh seafood starts coming to our local market in the early spring, I go a little crazy. And going a little crazy usually means I blow my budget. Maybe even by a lot. I think this spring we had an entire week of nothing but seafood. At the end of the day, though, it’s like a fun celebration of the end of winter and the beginning of lighter foods on our menu. As long as it’s not a usual occurrence, we’re ok. We make up for it over the next few weeks and we calm down our purchases. So stay on budget, but don’t let an occasional celebration ruin your joy. What would you like to see in next week’s tutorial? Tutorial Tuesday #1–Where is My Farmer’s Market? This post is the first in what I hope will be a series of tutorials on shopping at the farmer’s market. Maybe you want to buy a bit more from the market or maybe you want to completely makeover your shopping experience. Regardless, a little information never hurt, right? Making the shift from grocery store shopping to farmer’s market shopping can be a bit scary and uncertain. Will I be able to find what I need? What price is a fair price? What if I can’t find a particular vegetable? Do I have to pay in cash? What if I come up with a menu and can’t find my ingredients? And most importantly, where can I find farmer’s markets closest to me? In the past five years, farmer’s markets and farm-to-table restaurants have increased at an amazing rate. But if you don’t know where they are, their existence really doesn’t help you, does it? Finding the quality resources close to you is the first step in shifting your shopping habits toward eating locally. Here are three easy steps to find out where your local markets are and decide which markets you want to visit. 1. Visit your Dept. of Agriculture and Cooperative Extension websites. 2. Find a market near you. Visit the Local Harvest website HERE. Local Harvest is a wonderful organization, and their interactive farmer’s market map can help you find resources in your area. They also have a terrific electronic newsletter and a blog you can follow! 3. Visit your markets online. 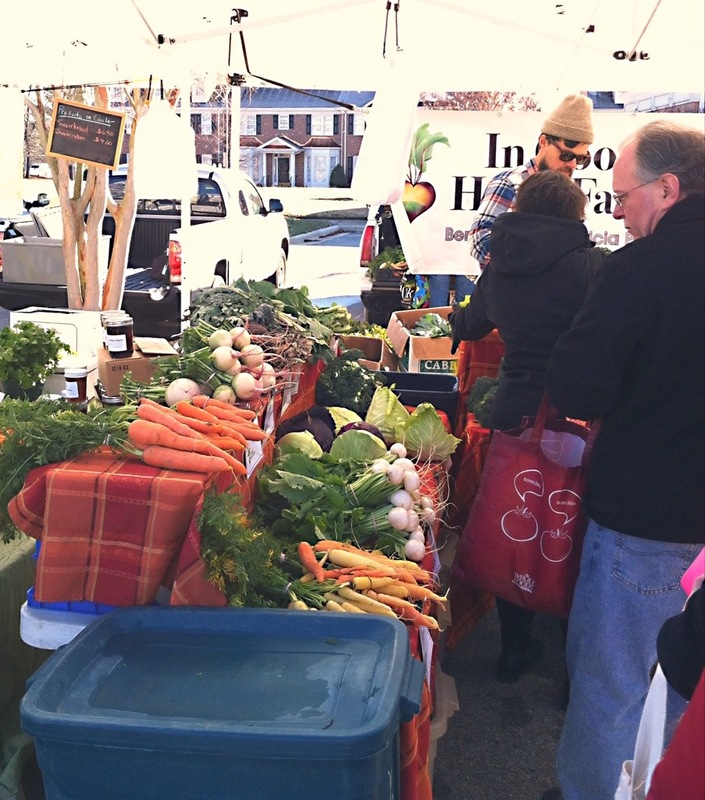 Many farmer’s markets now have Facebook pages, email newsletters and Twitter feeds. If so, sign up! You will likely receive advance information about what is for sale at the market and any special events in the future. Next post–Questions to ask farmers! Aside from small trips to Trader Joes, and occasional treks to Whole Foods, we have given up almost all grocery shopping. Occasionally, I find the need for something I can only find in the standard grocery, but that is pretty rare anymore. I have learned that I can make my own powdered sugar, self-rising whole wheat flour and buttermilk, so why buy them off the shelf? Now, in full disclosure, I have never loved grocery shopping, but since we started shopping primarily at our local farmers markets, going to the grocery has become even more frustrating and stressful. First, no one seems to know anything about the produce or meat sold in the grocery. I’m not dissing 16 year olds, but why oh why would I take produce advice from someone who has never cooked? Second, the things I need seem to be hard to find. Is it me or are steel-cut oats almost impossible to see on the shelf? And lastly, I continue to be amazed at how expensive processed food is. Sure, a box of Hamburger Helper is only .99 with a coupon, but you’re paying for mostly salt and pasta. Plus you still need to add meat and maybe canned tomatoes. Not a good deal when a whole box of pasta might be .99 and you get two or three times more than is in the box of Hamburger Helper. A loaf of bread might be $1.99, but for $3.99 you can get a 5 lb. bag of whole wheat flour that will make you 5 or 6 loaves of bread. 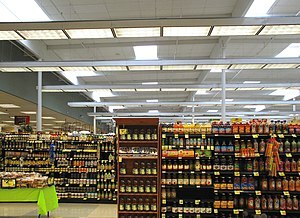 So I was intrigued this morning when I saw a Twitter posting from Earth Eats about the geography of a grocery store. None of this is really new information, but it is a good reminder that when you enter a grocery store, you (and most importantly, your children) are being carefully manipulated to make choices that are good for the grocery stores profits, but not good for the health of your family. Case in point: my daughter went looking in Trader Joes for peanut butter. Just plain ol’, no sugar added peanut butter. She grabbed a jar and off we went. Until I noticed during checkout that what she thought was peanut butter was some kind of cookie butter. WHAAAT? What the hell is cookie butter? We went back to the shelf and there were two entire rows of cookie butter at chest level, and the actual peanut butter was waaaaay down at the bottom. GRRRRRRR. Cookie butter, by the way, is cookies, fat and sugar. Now, maybe this is your favorite food in the world (I won’t judge), but it’s not what we want in our diet. And it is not a sub for peanut butter in Thai spicy peanut sauce. Shop the perimeter–the outside aisles is where the fresh food is. Look up–and down. The healthier, less processed food is often not at eye level. Here is a wonderful mantra to keep in mind (this is from Michael Pollan).